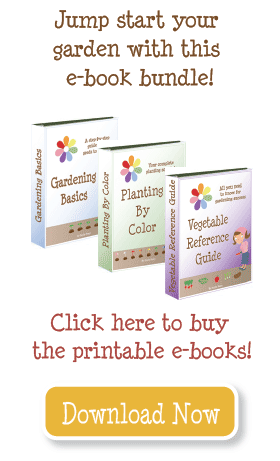 There are many different ways to garden, and each has its advantages and disadvantages. 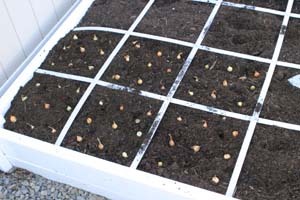 To begin, I thought I’d explain why, when I wanted to garden, I chose the square foot method. Easy Setup: The gardening bug hit me hard, but my husband has yet to catch it. I needed a garden I could plan, build, and maintain all by myself. I ordered my boxes from www.squarefootgardening.com, hauled peat moss, vermiculite, and bags of compost in my Ford Taurus, and put it all together with the help of a 15-year old neighbor girl. Space: Our lot is about 1/5 of an acre, and while I could have made room for a traditional garden it would have taken up most of my backyard. Simplicity: While there are a ton of things you CAN do to grow a successful garden, there are only a few things that MUST be done. Mel Bartholemew’s book All New Square Foot Gardening gives simple instructions to build, plant, and harvest a garden. BTW, the cheapest place to buy the book is Amazon.com. NO WEEDING. One of my boxes sits next to a weed-infested city park (separated only by chain link), and it grew maybe 10 weeds total. The other boxes had no weeds at all. I can easily say I spent less than 1% of my time pulling weeds. Following Mel’s method and using his “Mel’s Mix” instead of soil removed the most time-consuming and annoying aspect of gardening–weeds. In the future I hope to do a short overview of some of the other methods, and list the pros and cons of each. I took your advice and added a second tier to part of my raised bed so I could grow carrots. Total of 6 inches in part and 12 inches in the other part. Success!! I grew everything I wanted and am very happy. My freezer is full !I also made your salsa and my family really liked it. I plan to grow extra next year. This was our first garden and your site was very encouraging. Thank you and see you again next spring! You can grow in 6 inches, though I prefer 10-12 inches myself. I love your website. It has really helped me. I have a 4×16 raised bed with hardcloth on the bottom due to ground squirrels. I have approximately 6 inches of soil. Can I grow vegetables in that shallow depth? Inna–The risk of using soil is that it has weed seeds in it, and may be alkaline or acidic. I would not worry about it–use what you’ve got and if you don’t have as much success as you hoped, test the soil in the fall and add amendments. Love your site!! Thank you so much for all your work! I have a question/comment. I made 6 4×4 beds last year and added 3 more 4×6 last week. The new 3 beds went in a place where I had a very good traditional garden. So, to create ‘Mel’s mix’, I scraped off the great soil I had in that spot and added vermiculite, peat moss and a bag of compost. I am planning to add some bagged compost when I am ready to plant and some fertilizer as well but I am slightly worried that part of the mix was soil and not compost as Mel recommends. What are your thoughts? Thanks so much! You can choose to use bark or mulch, but it will decompose and weeds will grow there. I put down gravel, but it is a lot of work and it gets quite hot. I suppose another option would be rubber mulch. I’m excited about my new square-foot gardening beds. I have just one question. I’ve covered the walkways between boxes with garden fabric, but I don’t know what to cover the cloth with. Any suggestions? Thanks so much. I just wanted to thank you for all the time you have taken to share your knowledge with us. I tried a small 4×8 square foot raised bed last year and had pretty good success, even though we had a cold wet summer. I am going to expand that and add 2 more beds abou that same size this year. Have my seeds started inside as per youre direction! C’mon spring! I’M SO EXCITED! I CAN’T WAIT TO GET GROWING! I did a square foot garden several years ago and it is true, barely any weeds and the ones you get come up very easily because you get them out early since they are very easy to see and there are so few of them. Also, you don’t have drought problems like you do with a big row garden. It is by far the best way to garden. I put in SFGs last Spring as well and I LOVE them! I live in the Phoenix area where the native soil is terrible. To add to my problems, every spare inch of our yard is covered with landscape rock. Using raised boxes filled with Mel’s mix overcame both hurdles. Oh, and I never had weeds either! Hooray! I just wanted to thank you for your website! We don’t have a lot of space in our yard and my husband has been less than thrilled about tearing it up for a garden. I had been thinking about square foot gardening but didn’t have any info on them! I’m definately starting one this year! Hi Emily! Fun site. I will have to bookmark it and follow along with you this summer.